Perovskites. If you can't pronounce it, don't sweat it. But no matter how you say it, pervoskites are an amazing material that you should know about. Here I'll cover two different technologies in which perovskites can offer improved performance: displays and solar panels. I know what you're thinking, what the heck do the materials that make my TV awesome, and the ability to convert sunlight into electricity have in common? More than you might think. As a class of materials, perovskites have been around for decades, but it's not been until recently that scientists have discovered they are VERY useful for light harvesting and electricity generation. Think about it, your TV emits light when powered by electrons, and solar cells absorb light and convert it into electrons. At a basic level it's the same process, just in reverse. Let's dive in. you may not know is that there are currently only two types of quantum dots that are used in displays - cadmium selenide (CdSe), and indium phosphide (InP). It turns out, perovskite quantum dots have some properties that are even better than both of the commercially available solutions, in particular in the pure colors they emit. The full-width-half-maximum (FWHM) is a property of emissive materials that is used to characterize the width of their emission peak. The table below shows the comparison of a few different materials (smaller FWHM=better). Not only can pervoskite QDs be tuned throughout the entire visible spectrum, but they also have the distinct advantage of a more narrow peak width (for some colors even more narrow than an LED). The result: Impressive color. Perovskite quantum dots are still in the R&D stage, so no one is using them in commercial displays, but they might be soon. While the optical properties look great, there are two major drawbacks to implementing them in current display technology. Most flavors of perovskites contain lead, and electronics makers have done a lot of work to get rid of lead-containing materials in their products (solders are a great example). It would be a big hurdle to implement an optical component that contains lead. The stability of these materials is not yet sufficient to survive for years (or decades) in a TV. No one wants to buy a TV that changes color and dims over time! Rest assured scientists are working to develop lead-free perovskites and improve the stability of these materials so that someday perhaps they will find their way into your living room. If you work in the area of solar energy, you have almost certainly heard of perovskite solar cells. If you aren't familiar, here's a crash course. Perovskites burst onto the scene of photovoltaics in 2013 with efficiencies approaching 15% (impressive for a new material). But the truly impressive thing about this technology is how quickly it has progressed in efficiency in such a very short time. Thanks in part to the special electrical properties, and simple materials and methods used to create these solar cells (see C&E News video), many labs started experimenting, and the record efficiency skyrocketed to the current record of ~22%. 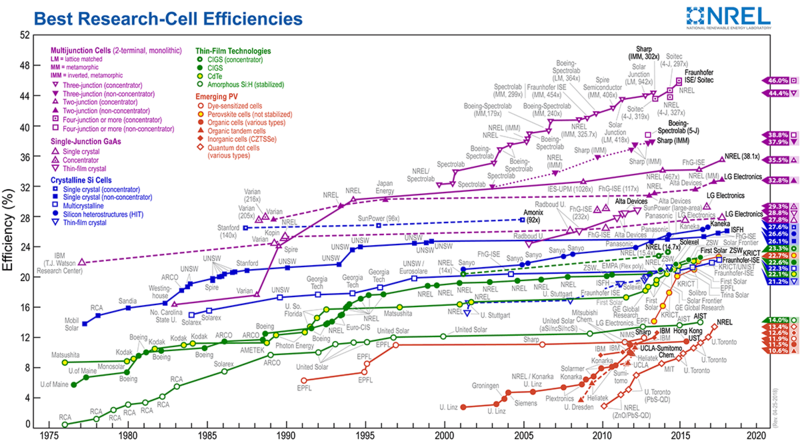 The chart below from National Renewable Energy Laboratory (NREL) tracks progress of research-cell efficiencies over time. As you can see, solar technology takes a long time to improve, with many technologies inching along at only a few % increase every decade. But perovskites (red circle with yellow fill) have jumped much faster than any other technology on the chart. And who knows where they'll stop. Perhaps some day your TV, phone, tablet, solar panels, and LED lights will all contain quantum dots. I enjoy the following thought experiment: A photon strikes your perovskite solar cell on your rooftop, which is then converted into electricity. That electricity travels to your TV or charges your phone where a perovskite quantum dot display awaits the electrical energy input to create color and light for your eyes to see. Photoreceptors in your eye convert that photon to an electrical signal in your brain, informing you of the color you are witnessing. Certainly not all of these energy conversion events are highly efficient, but with perovskites perhaps we can inch a tiny bit closer to perfection.